Booking a trip to Ha Long Bay can be overwhelming — there are a lot of options! If you want the full report of our trip to Ha Long Bay, check out this post. If you just want some quick tips to help make your trip better, keep reading here! I cannot emphasize this enough! The one-night (or day trip) tours BARELY scratch the surface of Ha Long Bay. You barely go into the karsts, and then come right back out. With the extra night (or more, if you can! ), you’ll see so much more of the bay and actually sail down into the meat of it. Especially since you’ll likely spend four hours driving to and from the bay, it’s really worth it to spend two nights! This is another reason to spend two+ nights: you can go to Cat Ba Island! In contrast to the negative review in Lonely Planet, we really enjoyed our time on Cat Ba Island. We had a free afternoon to hike up to the Cannon Fort, which may be our favorite part of the entire tour. The view is spectacular! If you’re not into hiking, you can get a motorbike to drive you up — or spend the afternoon at the beach! Hopefully this won’t be an issue, but there was a serious accident a few years ago that killed 12 tourists. Since then, I believe most boats have started keeping hammers (for breaking windows) in the bedside tables. Make sure you know where yours is, where the lifejackets are, and where you should exit if you need to! Also be smart when you’re kayaking — there are so many big boats around that can’t change course easily, so don’t get in their way! You’ll likely have a few opportunities to hike up to the top of an island. DO IT! The views from the top are incredible! If you’re actually staying on Cat Ba Island for a few days, or in Bai Tu Long Bay, you could also check out the rock climbing opportunities. I wish we’d had more time to climb! Most of the guides in Ha Long Bay speak English quite well. We took this opportunity to chat with them about their life in Vietnam — from their families to their education to their views of the Vietnamese government — and learned a lot. You’ll have plenty of hours to cruise around the bay without much to do but take in the scenery, you might as well chat and learn about the culture you’re visiting! As for booking a tour, I’ve heard time and time again to not go with the bare-bones absolute cheapest option. They’re just not quite as safe or organized! We did a mid-range tour, which was not much more expensive, and were shocked by the luxury cabin and the well-organized nature of the tour. 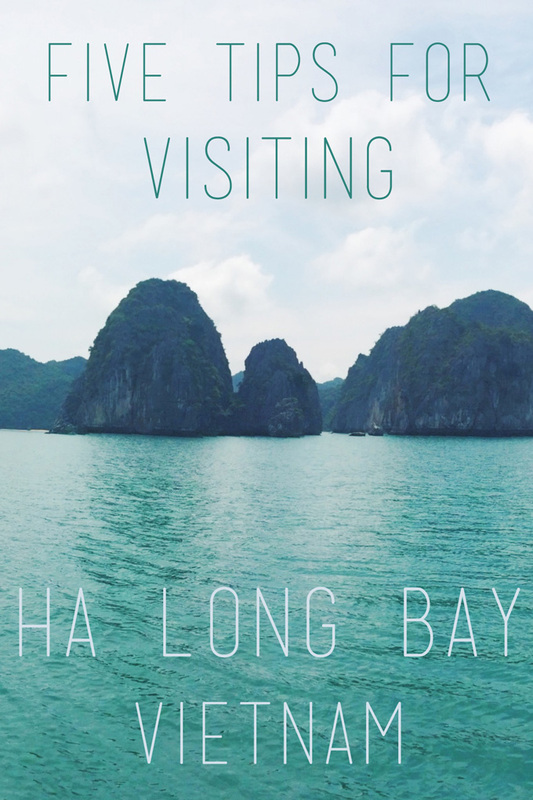 If you want more details on our trip, check out my full-details Ha Long Bay post! This is awesome. Thank you. Definitely bookmarking this post. Thank you for your Tips! Very Useful post. – Don’t miss Yen Duc village: a Rest stop on the way from Hanoi to Halong. – Check out attraction befor you go to not miss anything. You can find more in my website.